Well worth your time to hear the most elite PvPer in New Eden and the best FC CODEdot has. was a good listen once they got to the part with loyal. Their convo prior to loyal joining was the most fedora tipping, mountain dew swigging, cheetoh munching podcast that I ever listened to. I've noticed that when you filter out all the hysteria generated by some of the folks whom we encounter, the message of the New Order is actually simple and uncontroversial. Here, loyalanon responds positively, confidently and intelligently about a host of issues which form a large part of the belly-aching of the carebears. He scotches myths, explains mysteries and deals in reasoned tones with such thorny subjects as his off-on relationship with Tora Bushido of Marmite. 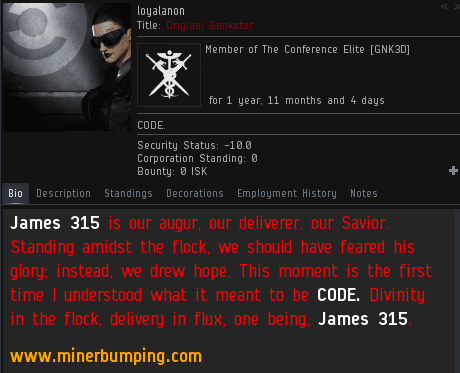 The loyalanon interview segment of the podcast is worth linking for its own sake, for the education of the citizens of Highsec. Well done loyalanon.